VIDEO: With Geneva talks showing little progress, human rights groups and opposition fighters say the Syrian government has increased its use of primitive, inaccurate weapons called “barrel bombs,” with a devastating impact on civilians in contested areas. VOA’s Al Pessin reports from London. Every war brings a new terror. In recent weeks so-called "barrel bombs" dropped from helicopters into rebel-held areas have emerged as the latest weapon of terror to kill and maim thousands of mostly innocent civilians. But now some rebel leaders are hinting the reign of terror brought on by the barrel bombs, assembled and deployed by forces loyal to Syrian President Bashar al Assad, could be coming to an end. Syrian opposition leader Ahmad Jarba told a Middle East television news station a few days ago that advanced arms are en route, including weapons designed to help opposition “get rid of these aircraft” — the government helicopters and warplanes that dump the explosives- or fuel-laden barrels over rebel territory. He would not say which countries would supply the missiles that rebels have long urged foreign backers to provide. ​The day before Jarba’s interview U.S. Secretary of State John Kerry forcefully condemned an increased use by the Assad regime of crude-but-deadly barrel-bombs, especially on rebel-held districts in the Syrian city of Aleppo. “Each and every barrel bomb filled with metal shrapnel and fuel launched against innocent Syrians underscores the barbarity of a regime that has turned its country into a super magnet for terror,” Kerry said in remarks issued by the State Department. On February 4, the Syrian opposition activists accused the regime of dropping a bomb on the Ottoman Bin Affan mosque in Aleppo, which was being used as a school. Fifteen boys were killed in the attack. One reason cited by U.S. officials in the past is that such missiles, capable of shooting down a commercial aircraft, could fall into the hands of terrorists or foreign Jihadists. And rebel commanders and Western diplomats say Washington had urged the Gulf countries of Saudi Arabia and Qatar not to provide them to the rebels. Rebels have managed to secure some MANPADS on the black market, but not in sizeable quantities, they say. Opposition activists say there has been a clear uptick in the use of barrel bombs in recent weeks, starting in December in the run-up to the Geneva 2 peace talks. This week activists posted harrowing online footage of the crude devices being dropped on the southern Damascus suburb of Daraya during the Geneva 2 peace talks, the first round of which ended without agreement amid bitter recriminations between the warring sides. Men inspect a site hit by what activists said was an airstrike by forces loyal to President Bashar al-Assad in the al-Sukkari neighborhood in Aleppo, Feb. 4, 2014. 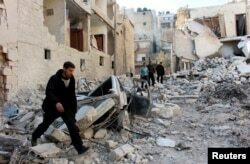 And government forces have been pounding several rebel-held areas of Aleppo with barrel bombs. Aleppo has been divided since rebels captured several districts in 2012, but government forces have started a new offensive on eastern approaches to the city. According to the Syrian Observatory for Human Rights, a U.K.-based pro-opposition monitoring group that relies on a network of informants inside Syria, as many as a hundred people have been killed by barrel-bombs in Aleppo over the past few days. Another rights group, the Violation Documentation Center, says that of the 433 people killed in Aleppo province airstrikes between November 22 and December 18, only eight were rebel fighters. According to rights groups, the bombs, first used in August 2012, are rudimentary devices made from oil drums or cylindrical containers packed with TNT and an assortment of metal parts, steel fragments or fuel, which are then topped off with a basic fuse that detonates on impact. Not equipped with any kind of guidance system, the bombs are simply rolled out of helicopters. According to Richard Lloyd, a technology consultant, the bombs are a cost-effective way of striking at built-up areas and sowing terror by killing arbitrarily. “The main objective of the Syrian barrel bomb program is to provide cheap and lethal damage on urban areas in Syria,” Lloyd wrote in a post for the influential Brown Moses Blog. But according to Peter Quentin of the Royal United Services Institute, who spoke via Skype, cost isn't the only factor that makes improvised devices Damascus's weapon of choice. Experts say barrel bombs are impossible to aim accurately and become increasingly indiscriminate as government aircraft fly higher to avoid rebel fire. A new innovation, altitude-sensitive fuses, make the bombs explode before they hit the ground, causing even more widespread damage. In this regard, says Brian Wood, head of Amnesty International's program on arms control and human rights, barrel bombs intimidate just like the chemical weapons the Syrian government was forced to stop using last year. Human-rights groups have condemned the Syrian air force’s use of barrel bombs, arguing that as an indiscriminate weapon they breach international laws of war, citing the UN Convention on Prohibitions or Restrictions on the Use of Certain Conventional Weapons, which prohibits incendiary weapons intended to cause injury “through the action of flame or heat” being used in civilian areas. 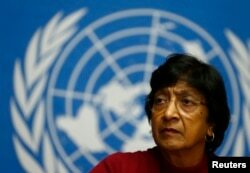 In December, Navi Pillay, the United Nations high commissioner for human rights, indicated that a U.N. rights monitoring commission on Syria was investigating the Assad government for war crimes, among them indiscriminate government artillery bombardments and air strikes on towns and villages. The U.N.’s commission of inquiry is also looking into war crimes committed by rebel forces, say U.N. officials. Barrel bombs aren’t the only ordnance being unleashed on civilians and rebel fighters alike. The use of cluster munitions and fuel-air bombs have also been documented. Last October, eyewitness testimony and video-evidence suggested a fuel-air bomb was dropped in the rebel-held city of Raqqa in the north of the country. The bomb hit a school killing at least 16. Fuel-air bombs are not considered chemical weapons, as they don’t unleash nerve agents or toxic gases. But they do utilize a chemical reaction with air to generate a super-intense, high-temperature explosion and a cloud of burning fuel. The U.S. first developed them for use in Vietnam and the Russians used them in Afghanistan and Chechnya. Military analysts say the fuel-air bomb dropped at Raqqa was likely a Russian-supplied ODAB device. VOA contributor Jamie Dettmer reported from Beirut and correspondent Al Pessin reported from London.